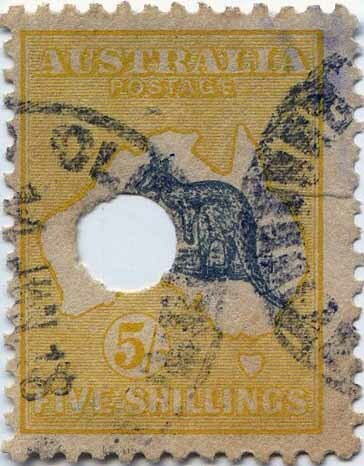 1d, 2d, 6d, 1/-, 2/-, 4/-, 6/-, 8/-. 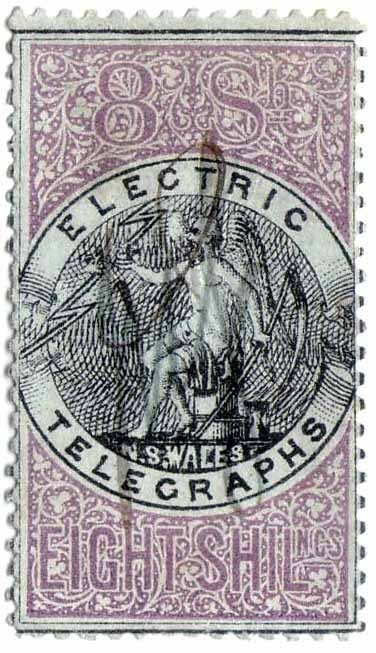 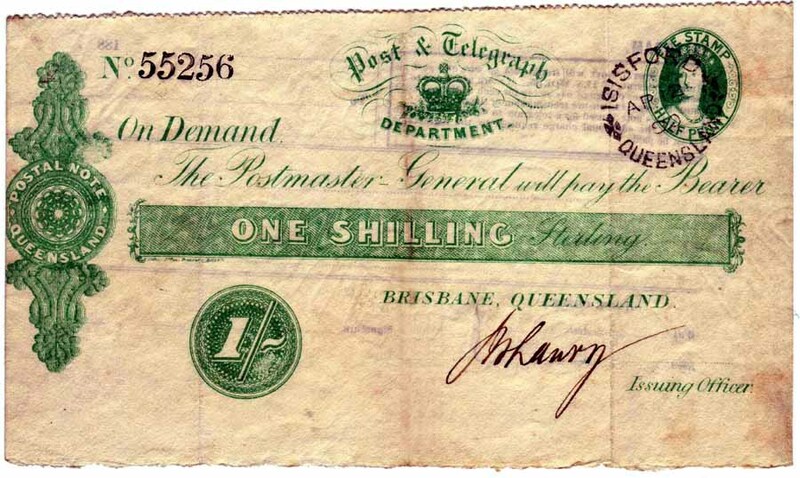 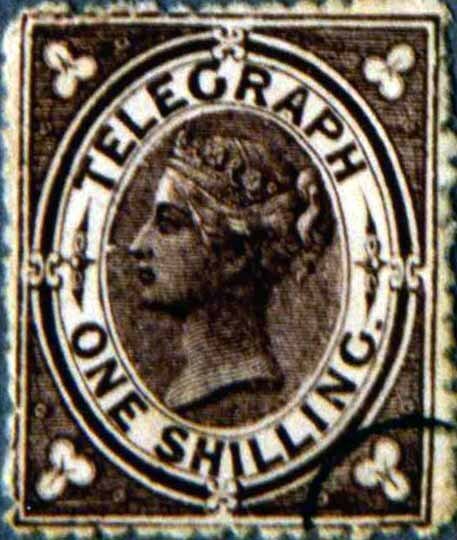 A 5/- Stamp Duty overprinted POSTAGE was supplied to the Superintendent of Telegraphs [16,400] even thou 10,000 10/- and 10,000 �1 duty stamps were also prepared and overprinted 'POSTAGE' for delivery to the Telegraph Dept. 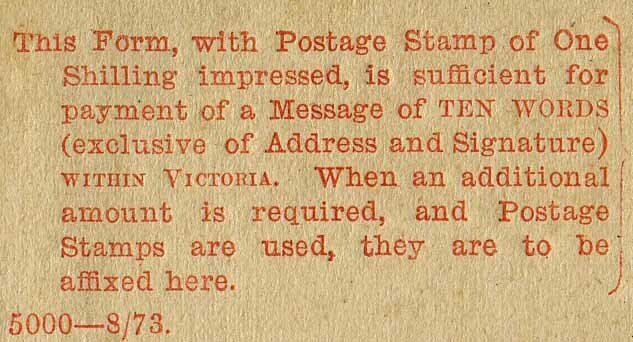 They were never sent to the dept and were used up by the Post Office. 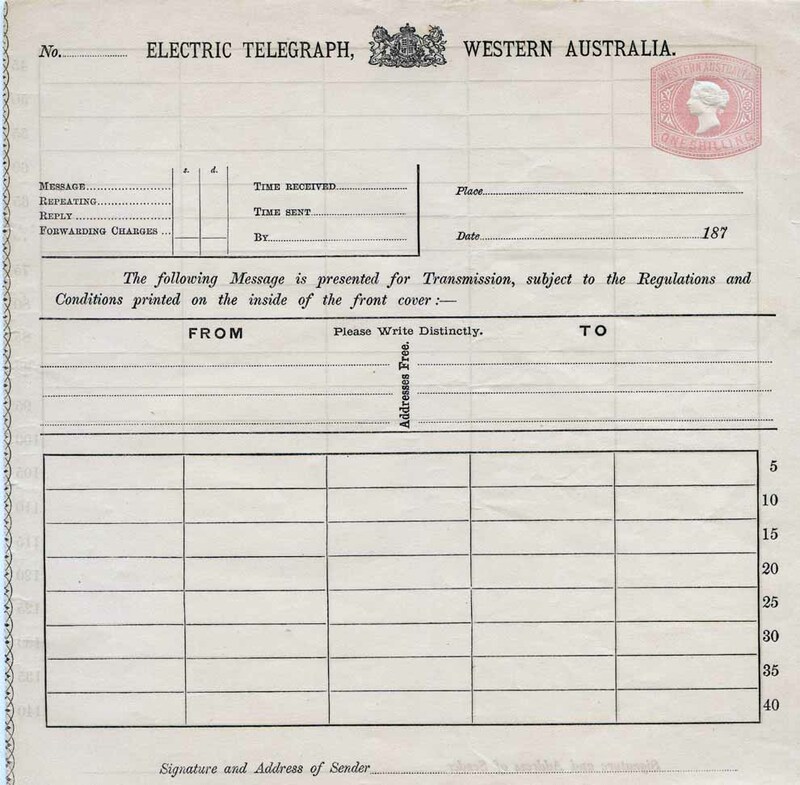 This system ran for 6 months only. 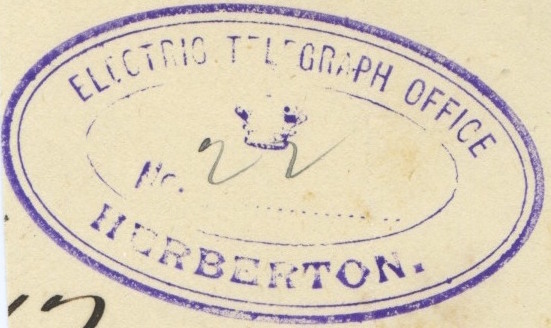 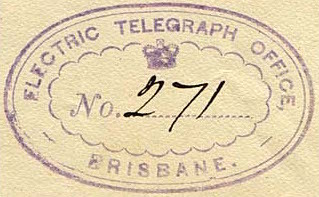 Various means of cancels can be found on both stamps and by themself on a telegram. 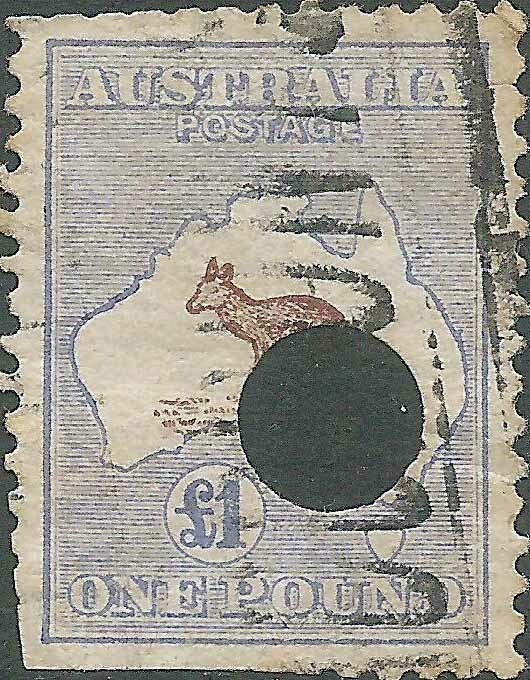 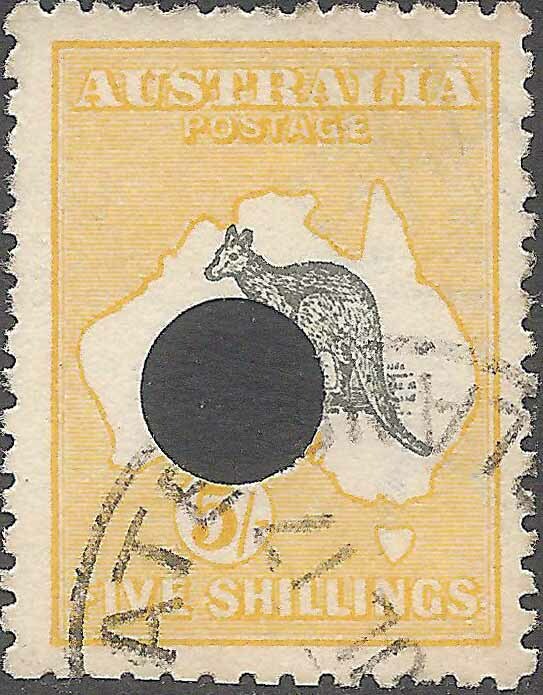 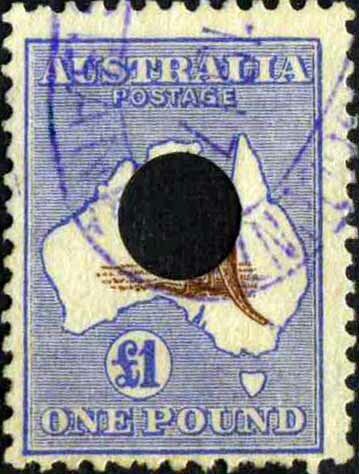 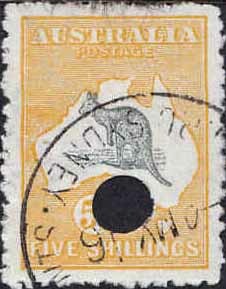 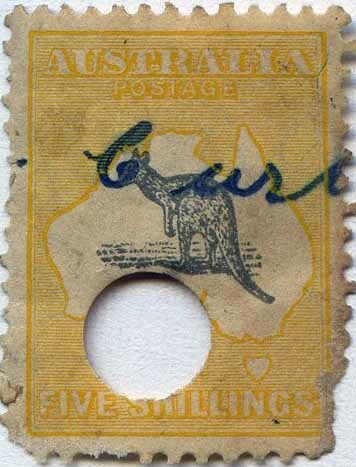 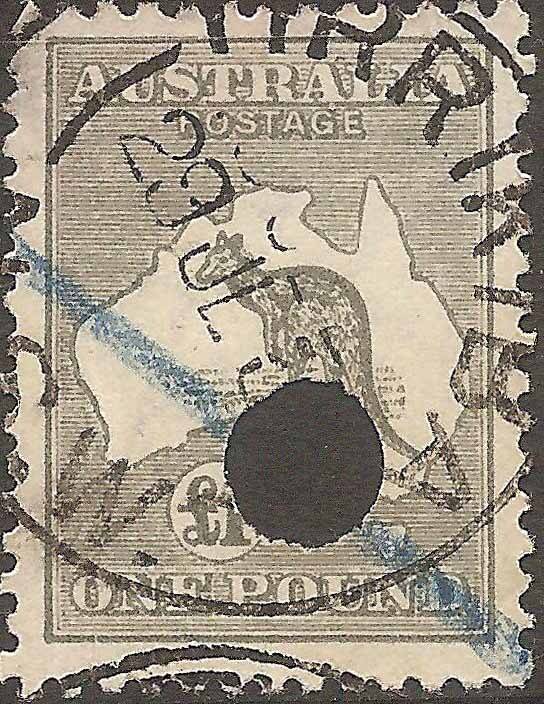 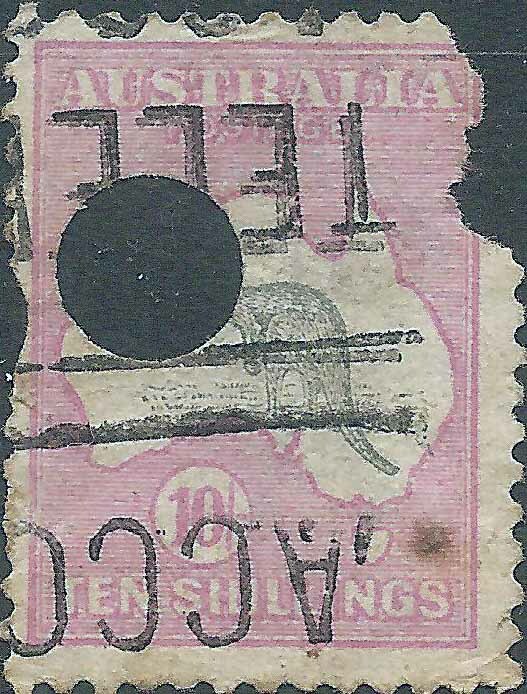 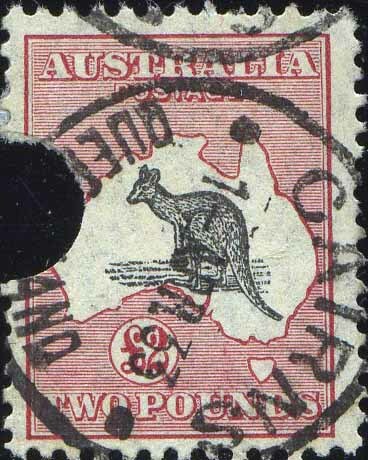 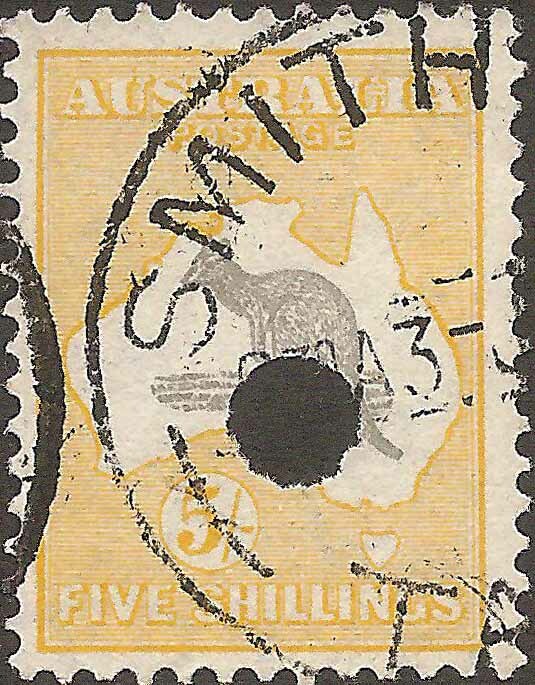 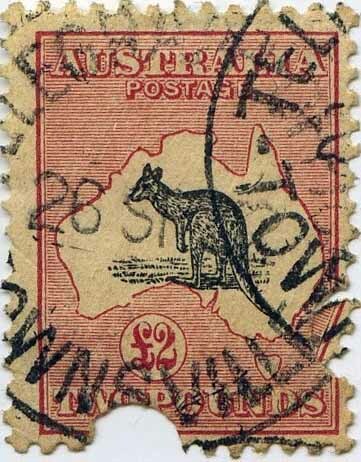 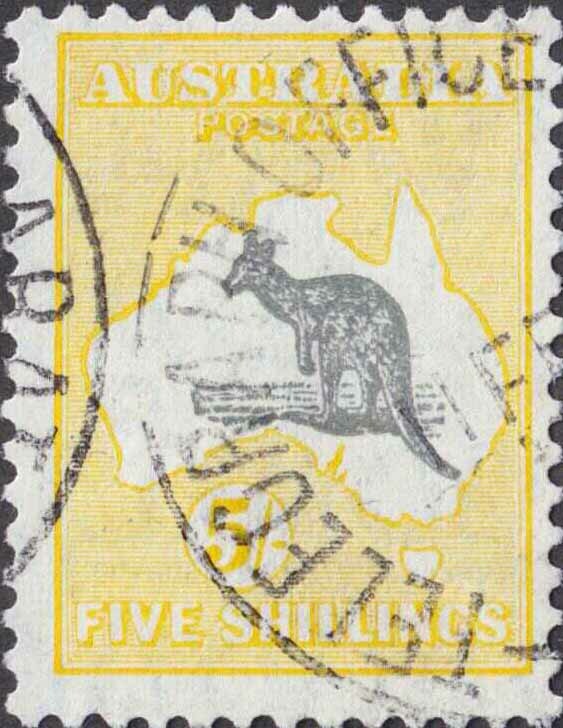 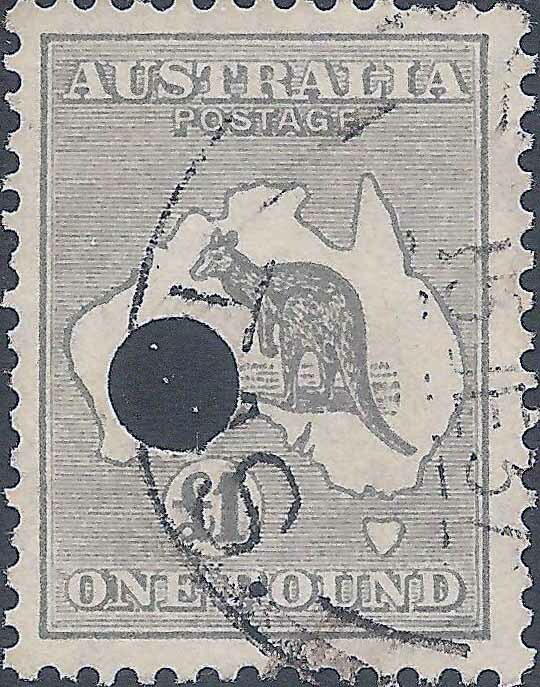 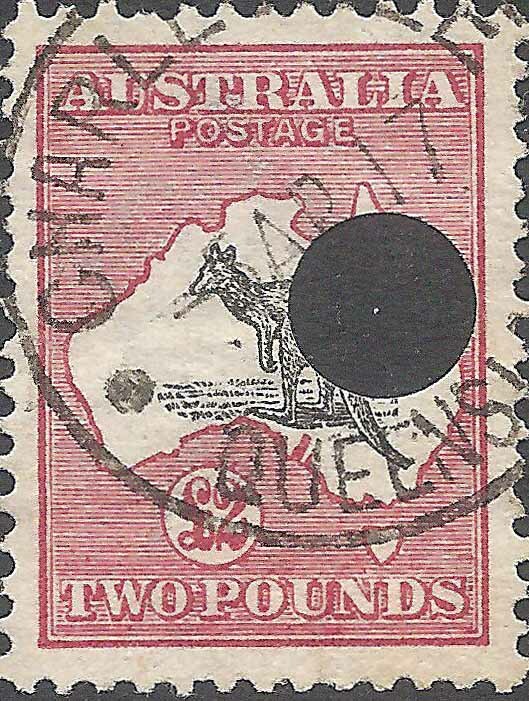 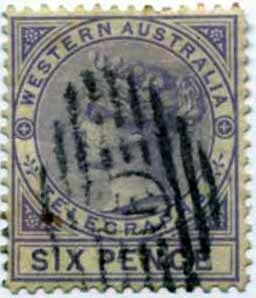 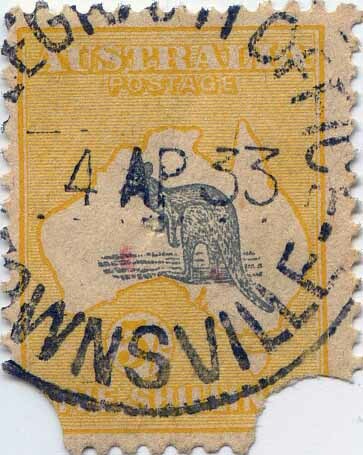 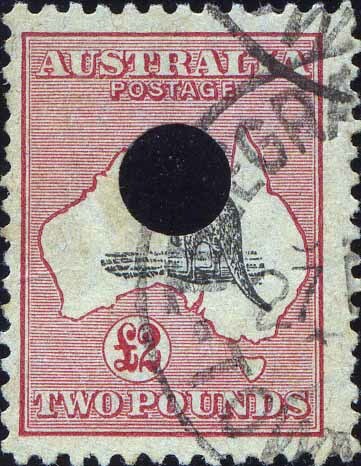 The following is the earliest circular handstamp recorded for any of the Australian States. 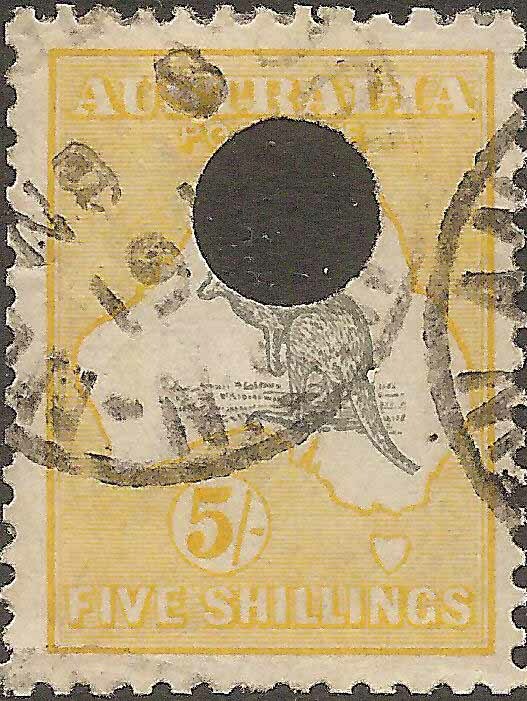 The following 5 are the earliest of the oval types recorded. 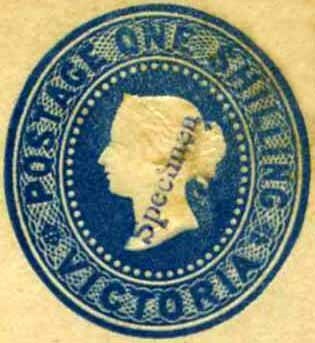 1879 Watermark Crown/CC Perf 14, 12½. 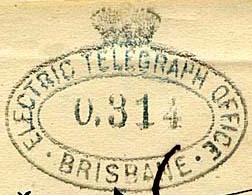 c1904. 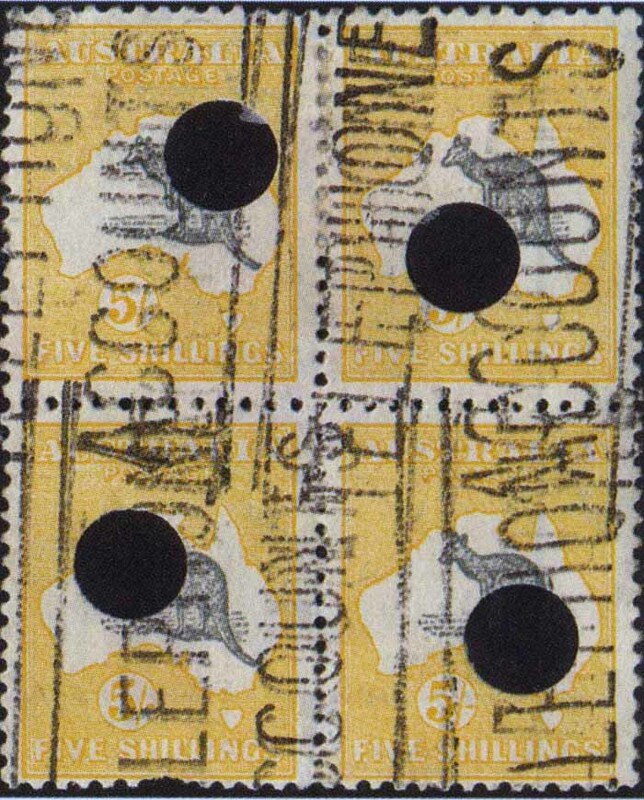 Printed brown on card perf 5�. 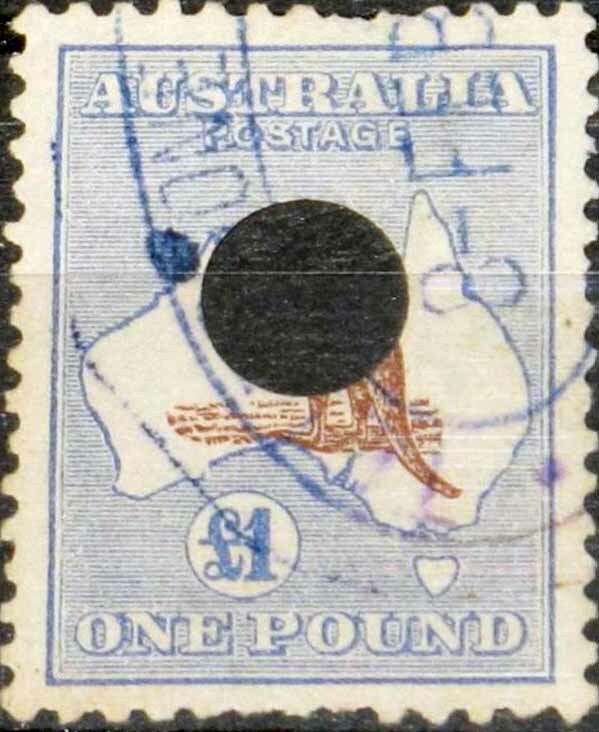 Black overprint. 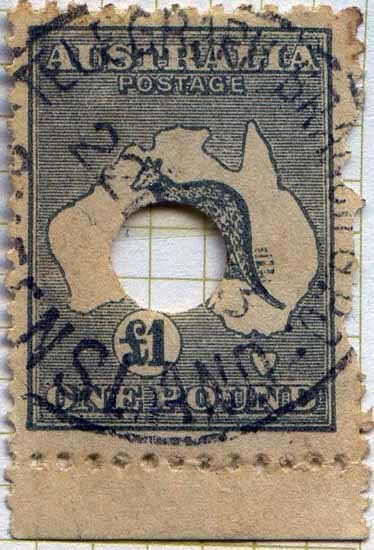 I recently came across a Bulk Postage Docket (shown below) and purchased the item partly because of its connection with Perfins and partly out of general curiosity. 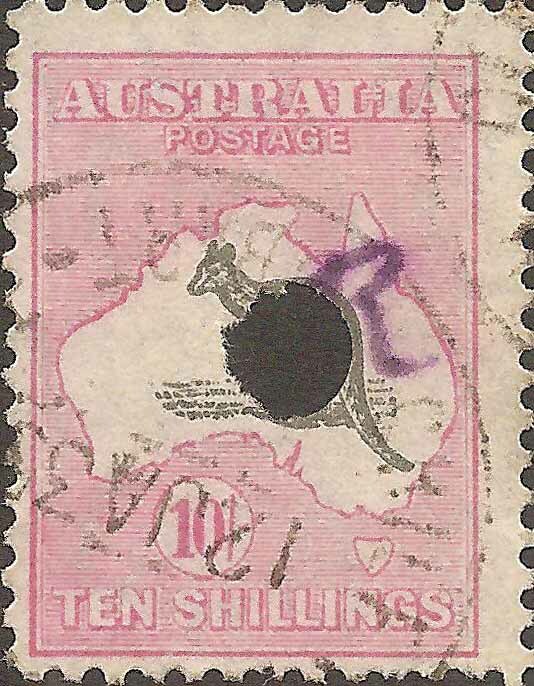 I was interested to know why the higher value stamps had been punctured to remove a rather large portion of the stamp paper - evidently after the stamps had served their purpose. 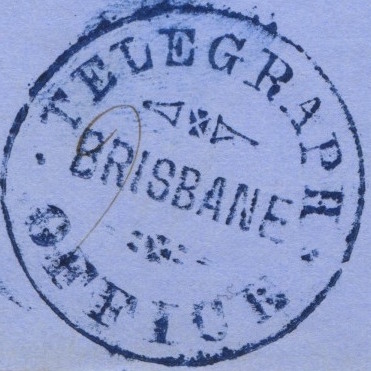 After searching unsuccessfully for an answer, I found that my question was more or less answered by an article, which I had written (and forgotten about) for a different journal in relation to Telegraph Punctures. 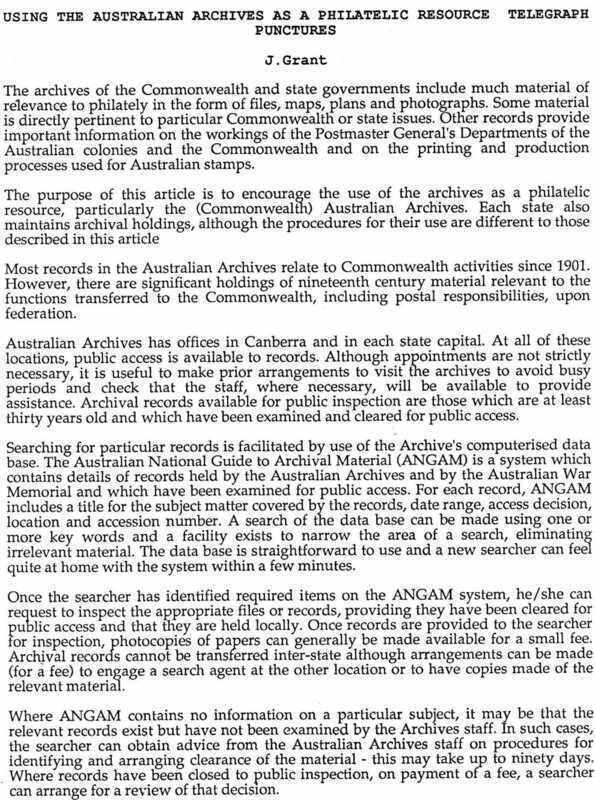 The following paragraphs originally appeared in Capital Philately (Vol 9, No 2, February 1990)(SEE BELOW GRAPHICS FOR ORIGINAL ARTICLE) and are reproduced with the permission of the Editor of that journal. 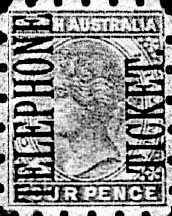 In October 1903, a stamp dealer who operated the Victorian Stamp Market in Flinders Lane, Melbourne, notified the Postmaster-General's Department of a possible irregularity in relation to traffic in used postage stamps. 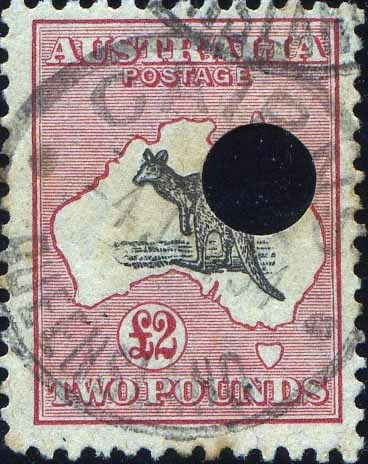 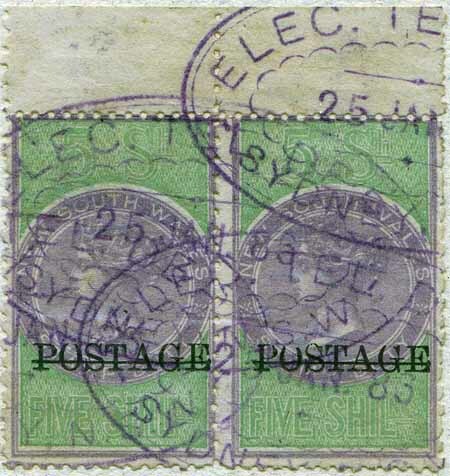 Two stamps of £1 and £2 value had been offered to the dealer by a young customer. 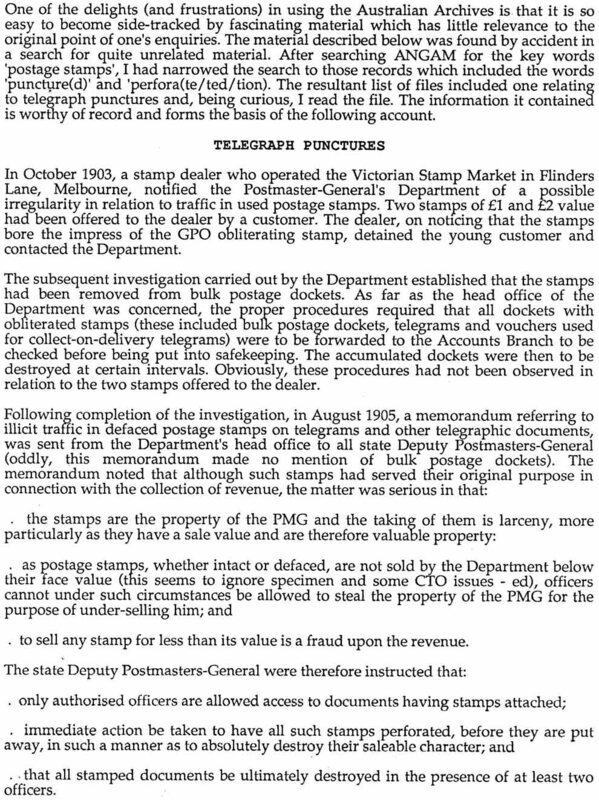 the dealer, on noticing that the stamps bore the impress of the GPO obliterating stamp, detained the customer and contacted the Department. 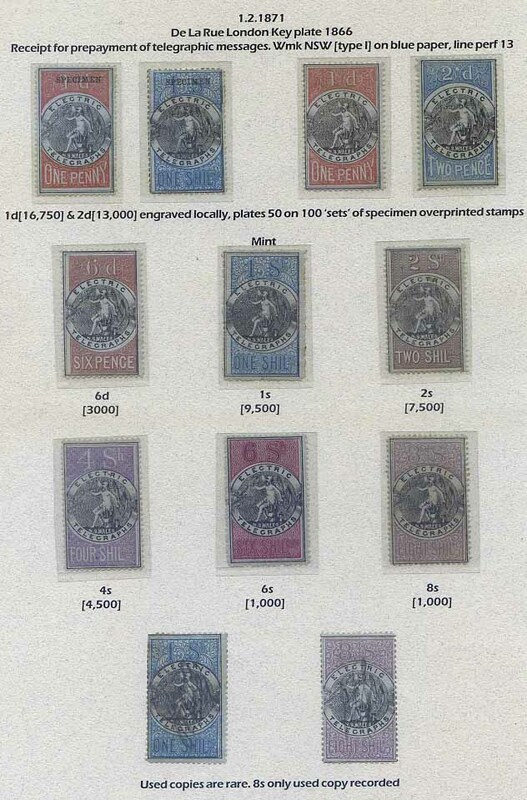 The subsequent investigation carried out by the Department established that the stamps had been removed from bulk postage dockets. 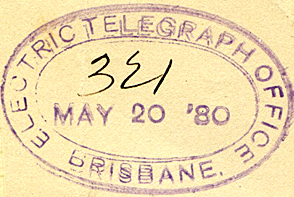 As far as the head office of the Department was concerned, the proper procedures required that all dockets with obliterated stamps (these included bulk postage dockets, telegrams and vouchers used for collect-on-delivery telegrams) were to be forwarded to the Accounts Branch to be checked before being put into safekeeping. 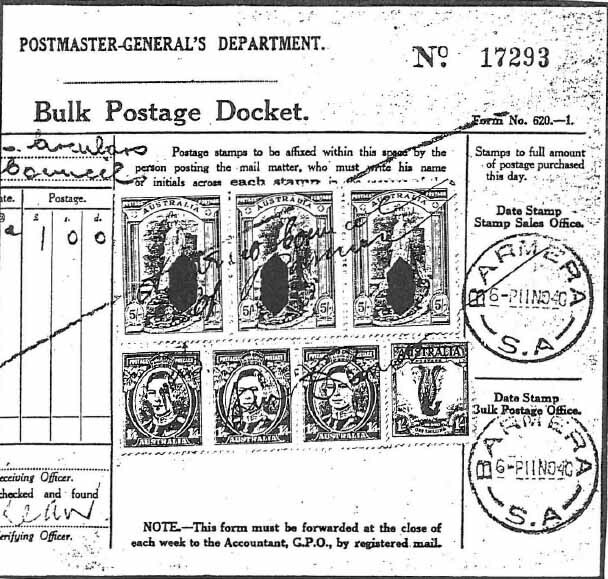 The accumulated dockets were then to be destroyed at certain intervals. 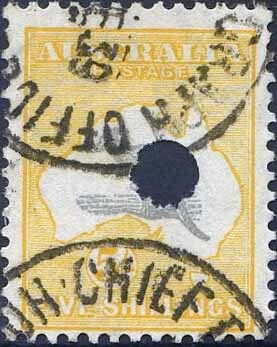 Obviously, these procedures had not been observed in relation to the two stamps offered to the dealer. 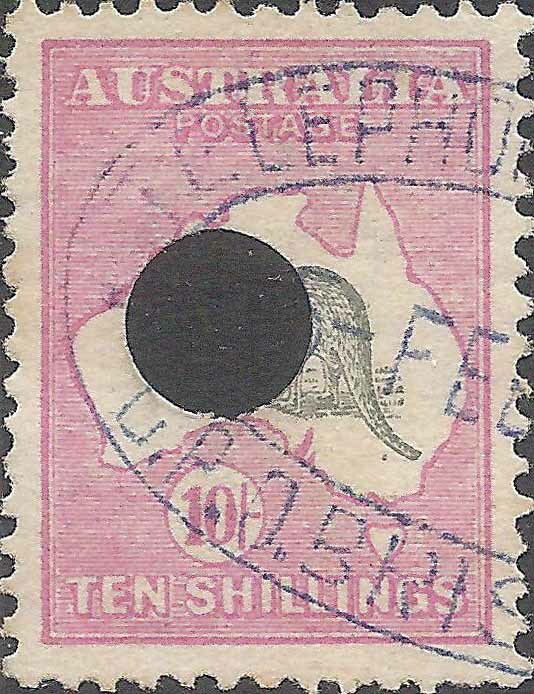 a. to sell any stamp for less than its value is a fraud upon the revenue. 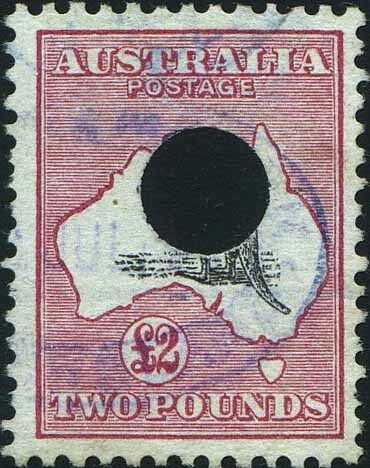 b. all stamped documents be ultimately destroyed in the presence of at least two officers. 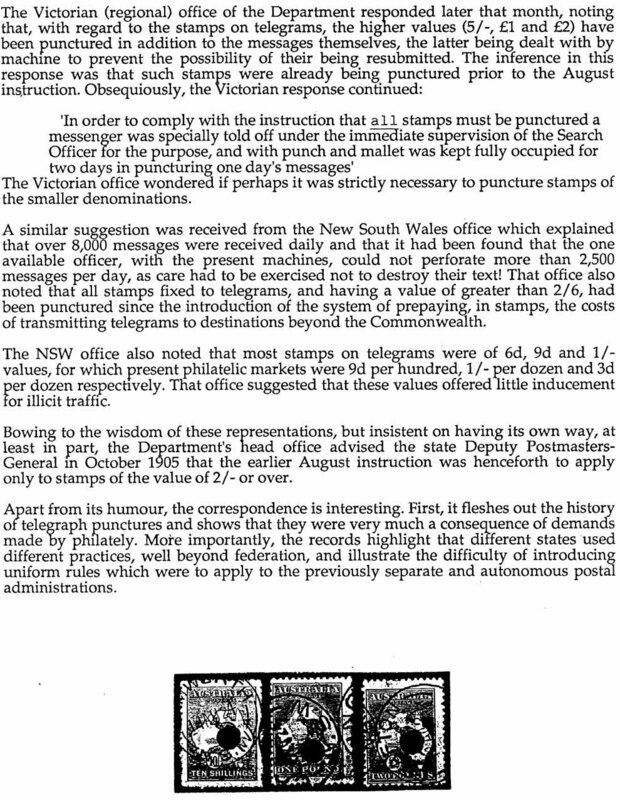 "In order to comply with the instruction that all stamps must be punctured, a supervision of the Search Officer for the purpose, and with punch and mallet was kept fully occupied for two days in puncturing one day's messages." 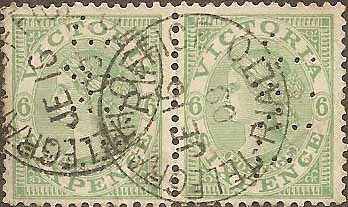 The Victorian Office wondered if perhaps it was strictly necessary to puncture stamps of the smaller denominations. 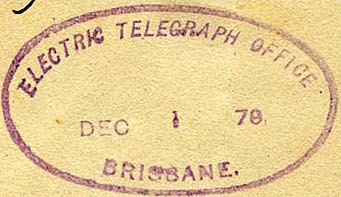 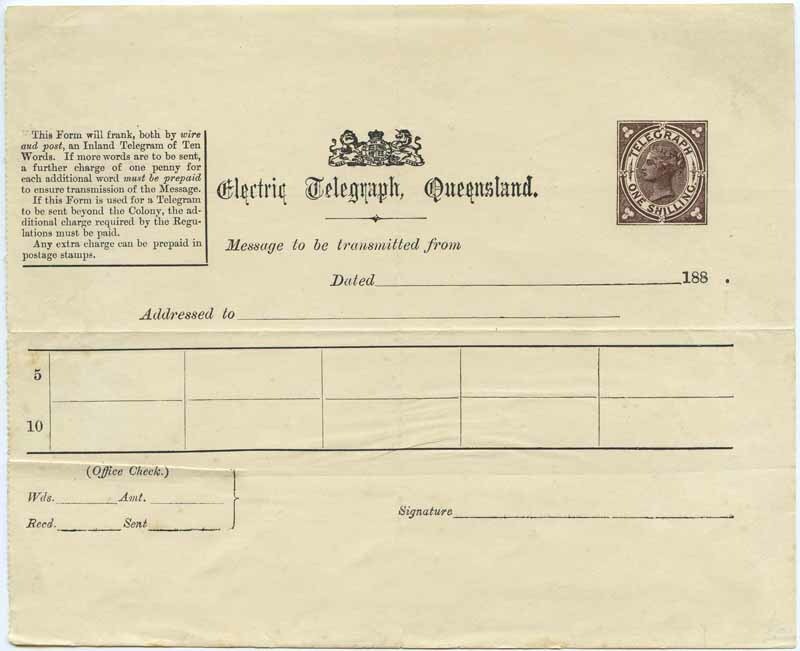 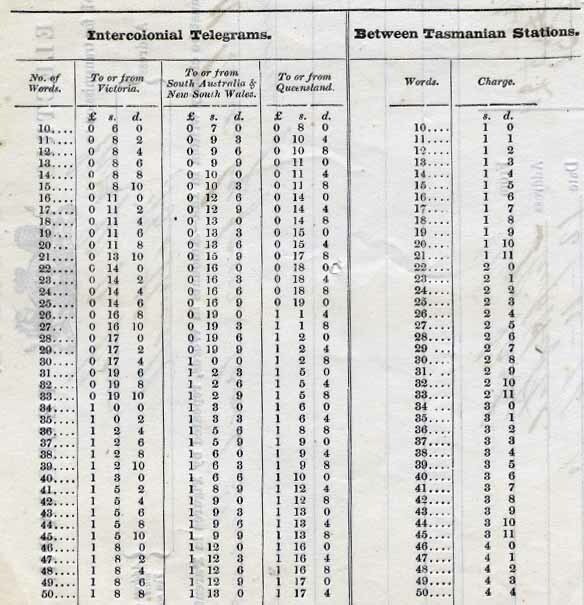 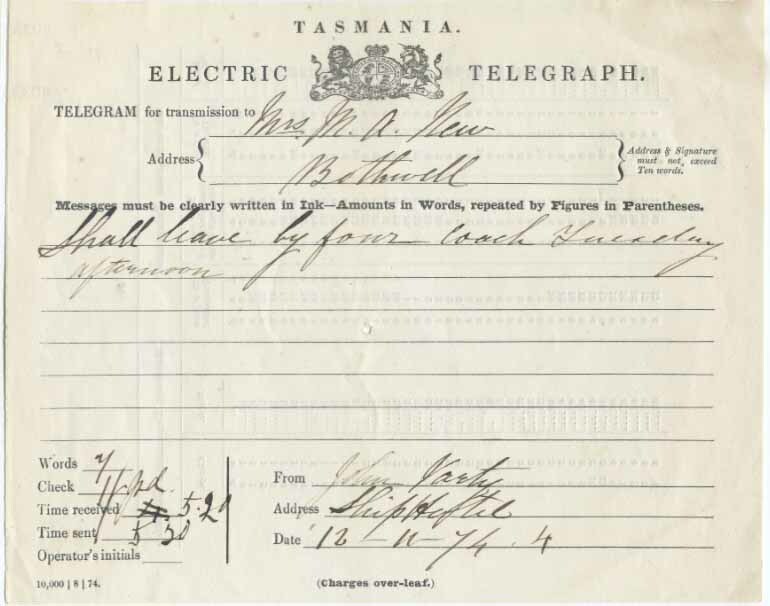 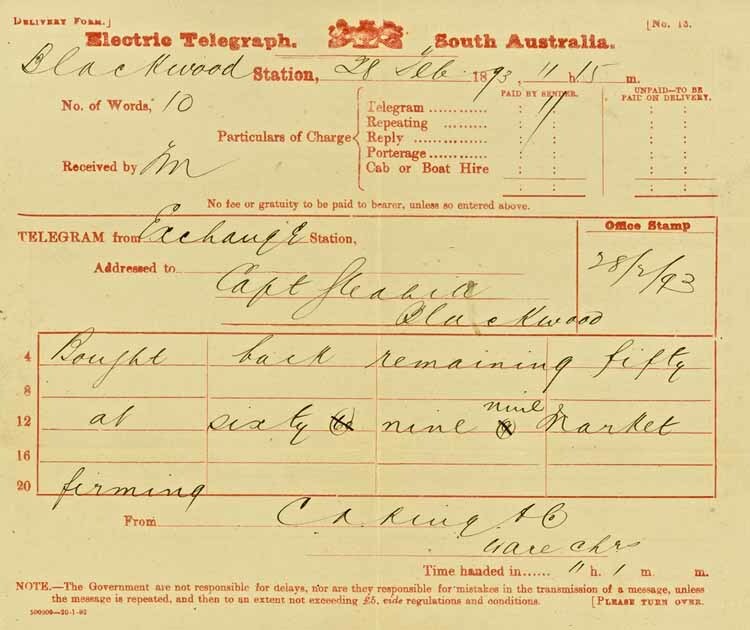 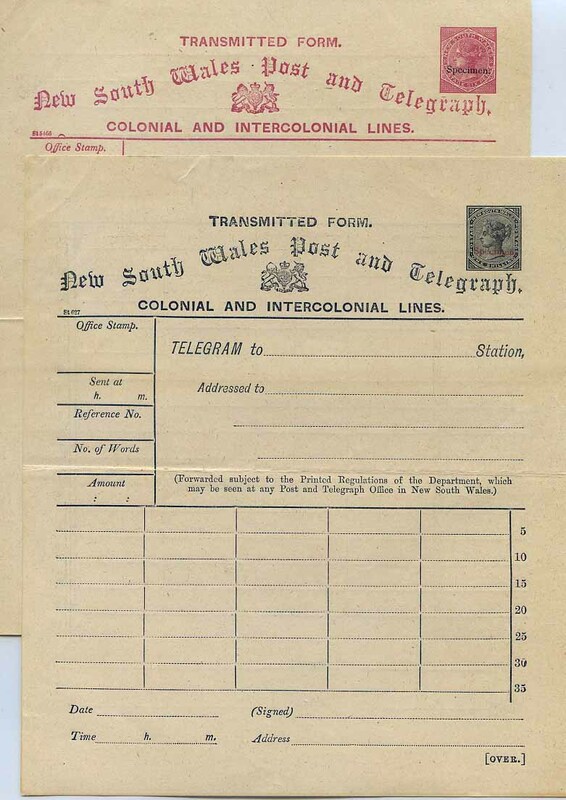 A similar suggestion was received from the NSW office which explained that over 8,000 messages were received daily and that it had been found that the one available officer, with the present machines could not perforate more than 2,500 messages per day, as care had to be exercised not to destroy the text of telegrams. 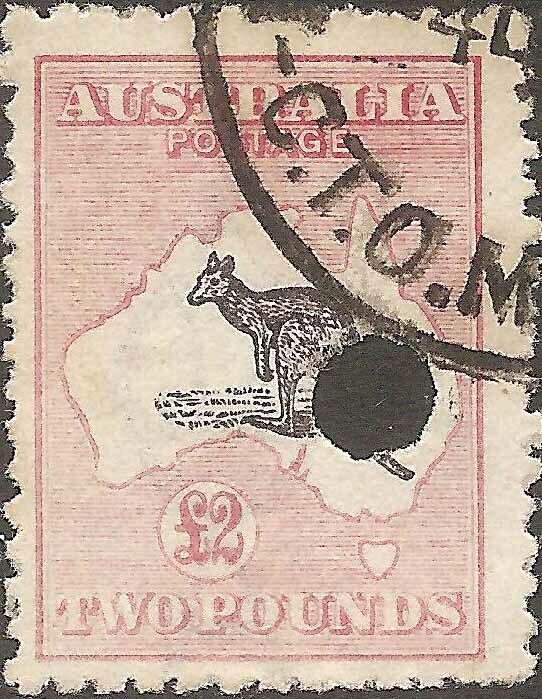 That office also noted that all stamps fixed to telegrams, and having a value of 2/6, had been punctured since the introduction of the system of prepaying, in stamps, the costs of transmitting telegrams to destinations beyond the Commonwealth. 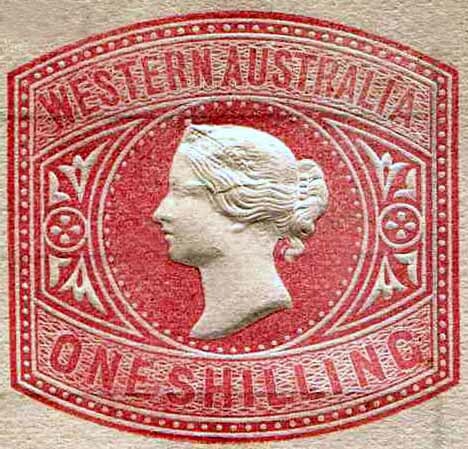 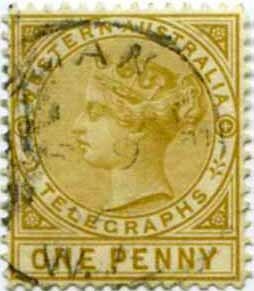 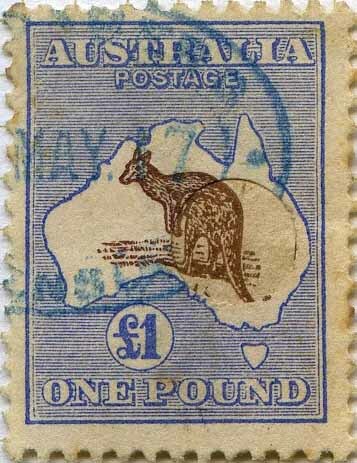 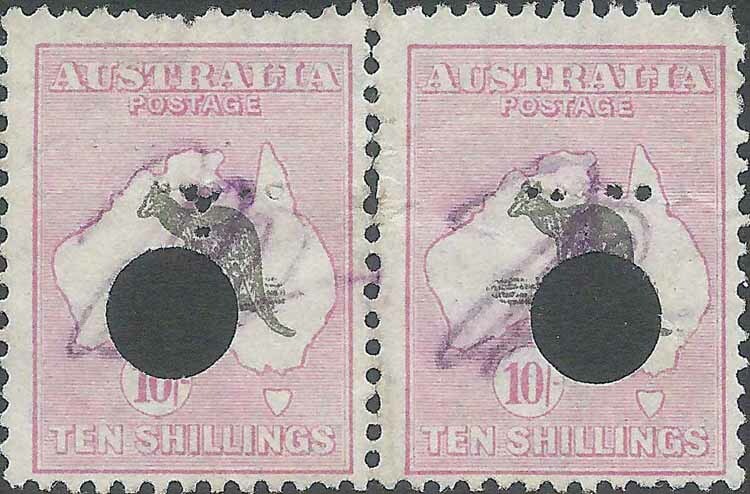 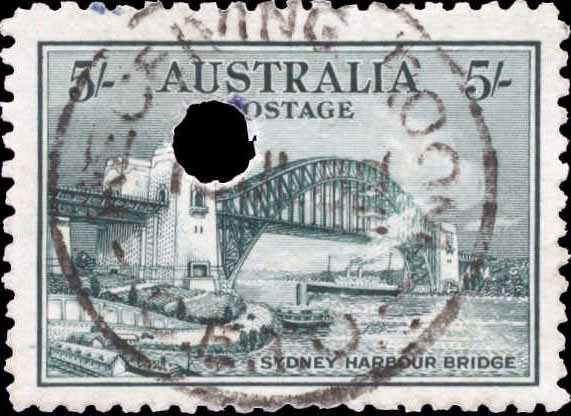 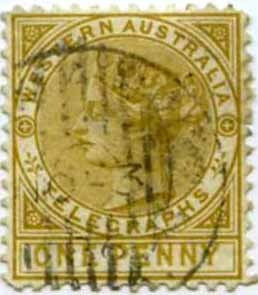 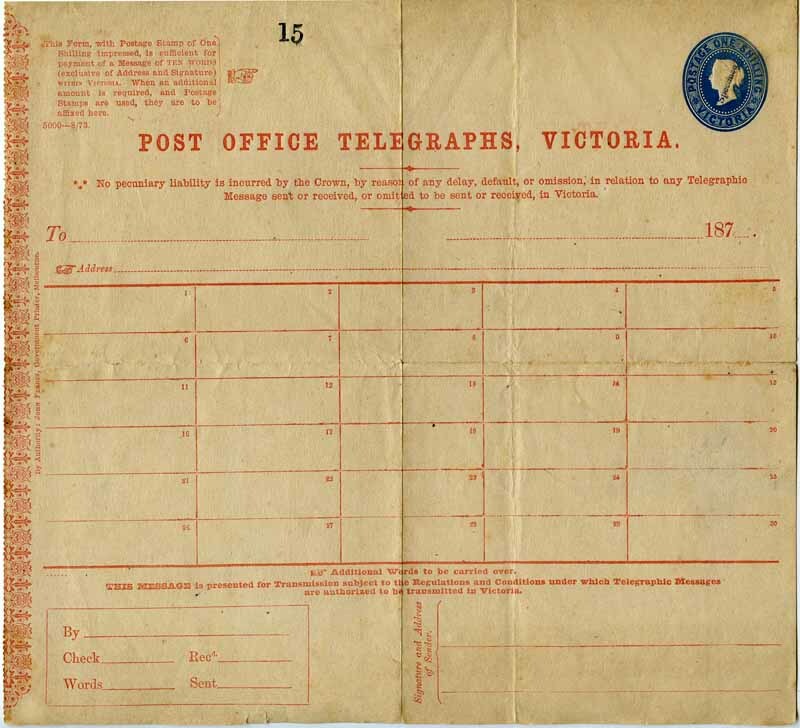 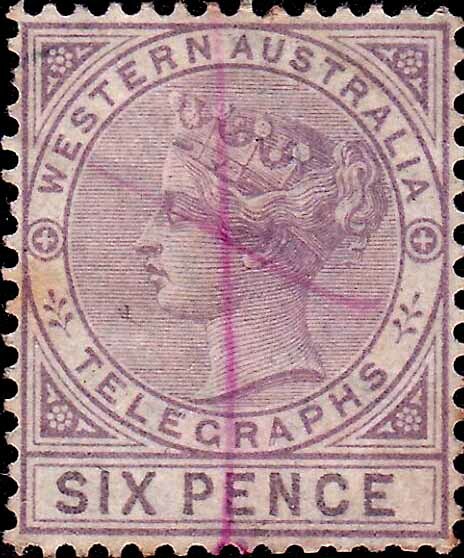 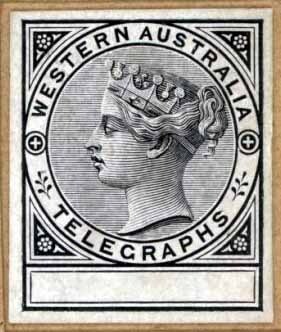 The NSW office also noted that most stamps on telegrams were of 6d, 9d and 1/- values, for which present philatelic values were 9d per hundred, 1/- per dozen and 3d per dozen respectively. 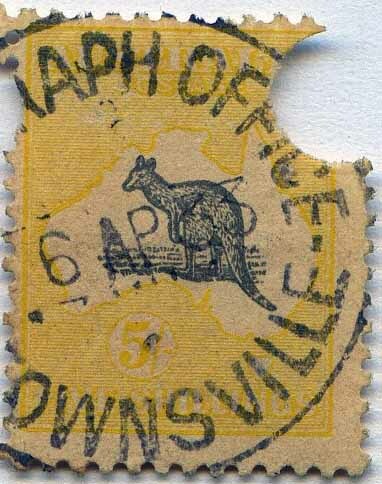 That office suggested that these values offered little inducement for illicit traffic. 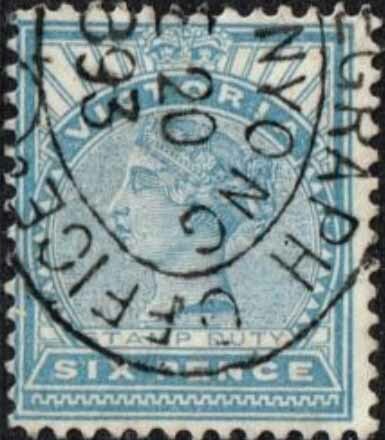 Bowing to the wisdom of these representations, but insistent on having its own way at Postmasters-General in October 1905 that the earlier August instruction was henceforth to apply only to stamps of the value of 2/- or over. 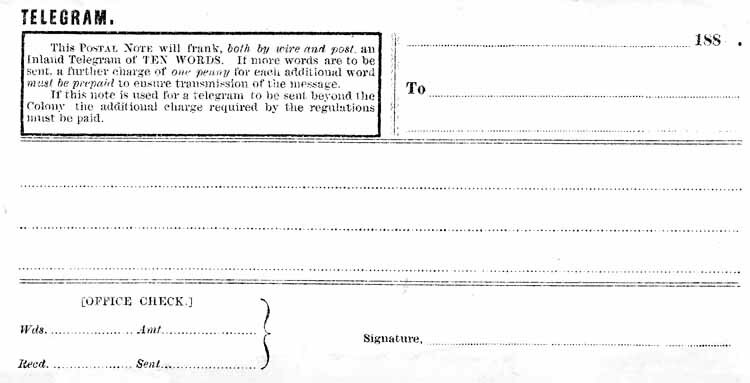 Apart from its humour the correspondence is interesting. 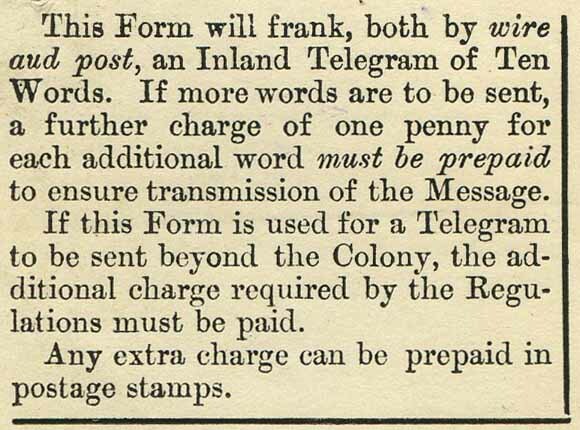 First, it fleshes out the history of telegraph punctures and shows that they were very much a consequence of demands made by philately. 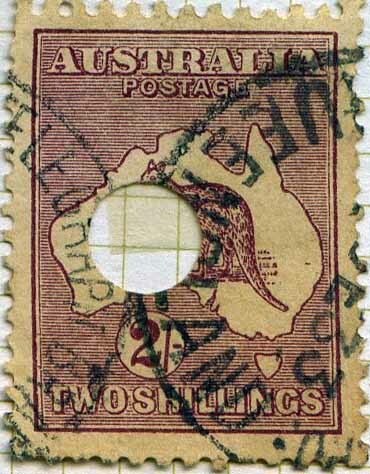 More importantly, the records highlight that different States used different practices, well beyond federation and illustrate the difficulty of introducing uniform rules, which were to apply to the previously separate and autonomous postal administrations.